"Over the years, we've heard stories from our customers who have lost weight by incorporating Fresco into their meal choices, and Christine had written Taco Bell a letter detailing her journey," Rob Poetsch, spokesman for Taco Bell to Adweek. Taco Bell's new ad campaign by DraftFCB features a "real-life Taco Bell customer" who lost 54 pounds over a two-year period by replacing her usual fast-food lunch or dinner with an item from Taco Bell's Fresco menu. While consumer feedback is mixed and dietitians split, there is no debate that the campaign is a publicity win. 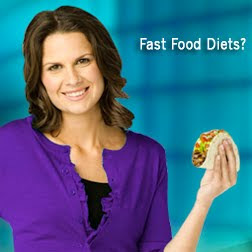 As laughable as it sounds, the Taco Bell "Drive-Thru Diet" is grounded in truth. According to an ABC affiliate, the Fresco menu that Dougherty dotes on features menu items with 20 to 100 fewer calories. In Dougherty's case, she dropped her calorie intake from 1750 calories per day to 1250 calories per day. In fact, according to the dietician, the Taco Bell campaign is more honest than the Special K Challenge that suggests you can lose up to six pounds in two weeks. At six pounds per week, Dr. Lokken said the challenge is based on reducing calorie intake (whether or not you eat Special K) and borders on promoting malnutrition. The question for advertisers to ask isn't how to duplicate Taco Bell buzz. The question to ask is how do you introduce a unique selling point that is so far removed from the brand that people hate it. Since launching the campaign, Taco Bell has scored on publicity and blog buzz, but consumer feedback is overwhelmingly negative. Before the campaign, Zeta Interactive noted that 73 percent of Taco Bell posts were positive, well ahead of Subway, Wendy's and Domino's. Following the campaign, the number of positive posts has dropped to 67 percent, dropping it below White Castle, Blimpie, and Arby's. The criticism is especially harsh from women, ages 18-34, with negative sentiment from this segment climbing steadily. It's climbing fast enough that the Taco Bell campaign could feasibly face a boycott. In contrast, when fast food chains like Wendy's and McDonald's launched healthier menu items, they received a surprisingly amount of praise. The difference is subtle, but underscores the fragile brand theory: Consumers equate cereal with healthy choices and fast food with fat. It's a difficult association to break, even when it's true. The reason Wendy's and McDonald's didn't face as much push back is that both offered non-fast food menu items. Taco Bell, on the other hand, is marketing items that still fall well within the fast food category, despite lower calorie and fat counts. Add in the timing of the campaign, when people are most sensitive to fitness, and combining "diet" with "drive thru," and the result is a campaign that wins on attention, but falls flat on public sentiment. I don't recall the same pushback against Subway for the Jared campaign. Taco Bell's version is a carbon copy, but it has a selling point that Subway can't match: the Drive-Thru angle. And if Subway tried launching Jared today, it would be blasted, and accused of turfing it. I don't believe Subway had any push back. And I don't think it would have all that much push back today despite bloggers. Your second graph conveys the point. People rather a Subway sandwich with extra Mayo and cheese is healthy over a fast food taco any day of the week. Never mind the facts. What is especially interesting to me is how this fits within relative branding and how people categorize companies based on there position within a sector. E.g., sandwich shops aren't generally thought of in the fast food category. Quick service burgers, chicken, and tacos are. Hope you're new year has had a excellent start! Considering Multimedia: What Is Possible?